There are critical moments in every campaign that can shake up a race: a primary campaign, the selection of a running mate, a convention speech, or a nationally-televised debate. But only one -- the convention speech -- offers each contender the chance to lay out a specific vision for his term in office and to ask the country for a mandate to carry it out. In a year in which the White House race has revolved less around those policy specifics and more around the food fight over social issues, taxes, bank accounts, and how the candidates treat their dogs, the party conventions in Tampa, Fla., and Charlotte, N.C., stand out as moments for President Obama and Republican challenger Mitt Romney to stand before tens of millions of Americans and actually tell them what they would do with the most powerful office in the world. However stage-managed and made-for-television they may be, the conventions offer the eventual winner a moment he will need to define himself and his agenda and to ask for the nation’s buy-in. Given the challenges the country faces, from the so-called fiscal cliff looming at year’s end to longer-term structural dilemmas facing entitlement programs to an economic recovery that continues to creep along, the winner will be in desperate need of a mandate. Romney’s decision to select Rep. Paul Ryan, R-Wis., as his running mate hinted that the presumptive nominee was reaching for a mandate. “I certainly expect to have a person that has a strength of character, a vision for the country that adds something to the political discourse about the direction of the country. I happen to believe this is a defining election for America, that we’re going to be voting for what kind of America we’re going to have," Romney said in an interview with NBC News’ Chuck Todd. And yet, an election that is shaping up to be a choice between two evils, decided by an evenly divided electorate, seems unlikely to produce a mandate for either side. Romney’s choice of Ryan allowed Democrats to attack his budget proposal -- the very thing that gave Ryan his “vision for the country” -- while Obama has yet to articulate a real agenda for a second term that isn't a direct contrast to Romney. Even with a clear majority for one candidate or another, the gridlock of the 112th Congress isn't likely to change. Republicans are highly likely to hold the House, even if Obama wins another term. Democrats keeping control of the Senate is an even-money bet, and Republicans won't get anywhere near the 60 votes they need to cut off filibusters even if November brings a GOP landslide. 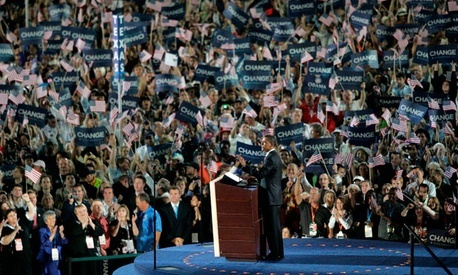 But it is essential that both Obama and Romney lay out their visions at the conventions -- essential not just to their campaigns, which will produce slick videos, soaring speeches and scathing attacks, but to their presidencies. History argues that a successful president uses his campaign to establish a clear vision for the future, something voters can ratify. Democrat Bill Clinton established the foundation for his second term in his 1996 convention speech, in which he pledged to build a bridge to the 21st Century. Republican Ronald Reagan’s 1980 convention speech called for a “rebirth of the American tradition of leadership at every level of government and in private life as well,” a theme that echoed across his eight years in office. For presidents without a mandate, the consequences can be severe. Republican George W. Bush won reelection in 2004 by campaigning against his opponent as much as for his own vision of the country. His second term began with a proposal to overhaul Social Security, an issue that hadn’t been litigated during the campaign. It failed, virtually grinding Bush’s second-term domestic policy agenda to a halt. Obama has had trouble with the mandate voters handed him in 2008. His entire campaign of hope and change gave way to an economic disaster that no one saw coming, a quagmire that forced Obama to sideline much of his own domestic agenda in order to forestall a full-on depression. But as the recovery began, Obama shifted focus to revamping the health care system, which led to partisan bickering over an individual mandate -- a practice he had pledged to stop over a program he had specifically campaigned against when it served as the centerpiece of presidential rival Hillary Clinton’s health care plan. Claiming a mandate that doesn’t exist can be as politically toxic as misreading or mishandling a mandate that does. The last three cycles have all delivered mandates against a party in power, rather than for the ascendant party. In 2006, voters cast ballots against Bush, rather than for Democratic leaders Nancy Pelosi or Harry Reid. In 2008, voters again kicked Republicans out of office, as much for the change as for the hope. By 2010, voters tired of health care debates and angry at the slow pace of recovery punished Democrats and brought Republicans back to power. It will be tempting to dismiss the stagecraft in Tampa and Charlotte as the dying vestiges of conventions that really mattered, made-for-television productions that amount to little more than hour-long commercials for either side. But the conventions matter: Even if the events don’t move poll numbers, Obama and Romney will have their last unadulterated chance to make their pitches. Whether the next president seizes a mandate or spends the next four years fighting with Congress could depend on what they say.